"A fisherman, angry with his wife, Anna, for serving him nothing but cornmeal and molasses, one day adds flour and yeast to his porridge and eats the resultant bread, while cursing, 'Anna, damn her.'" There are many popular myths about the origins of the name of this New England bread but whatever the story, it is Dan's favorite bread! 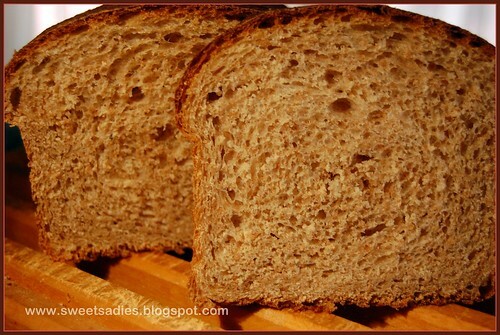 It is a great sandwich bread and is particularly good toasted (with lots of butter). This is the first bread in the Bread Baker's Apprentice (BBA) Challenge*. 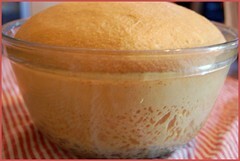 The day before making the bread, you make a soaker, a mixture of cornmeal and water. This breaks the sugars free... and the flavor is improved. The next day, you add the soaker to some of the flour, yeast and water. Cover it and and let it ferment for one hour or until it bubbles. Add the remaining flour, the salt, molasses and shortening and mix on low speed with the paddle attachment until it forms a ball. 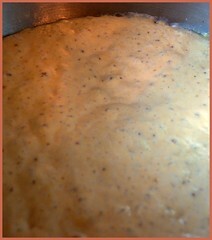 If using an electric mixer, change to the dough hook and mix for 8 -10 minutes. the dough should be firm and pliable but not sticky. If it is sticky, add a little flour. 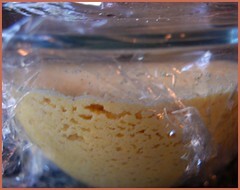 Lightly oil a bowl and transfer the dough to the bowl. Roll it around to coat it with the oil. Cover with plastic and let double in size - about 90 minutes. Remove the dough from the bowl, divide it into 2 or 3 equal pieces and shape it. The beginning of the book shows various methods of shaping. 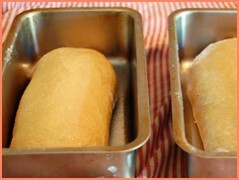 Place the loaves into bread pans and mist the top with spray oil. Cover them loosely with plastic wrap. Proof for 60-90 minutes or until the loaves crest fully above the tops of the pans. Preheat the oven, mist the tops with a spray of water and dust with cornmeal. Bake until the loaves are golden brown and register at least 185 to 190 degrees in the center. they should make a hollow sound when thumped on the bottom. When the family arrived home tonight, the smell of the Anadama bread drew them into the kitchen...the butter was uncovered...and one bread is already gone! Onto the Greek celebration breads! *In support of the BBA book, we will not be posting the recipes. 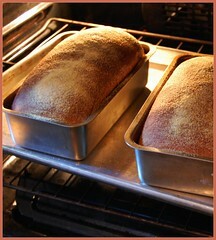 Wonderful looking loaves. YUM. Great job and super baking along with you.